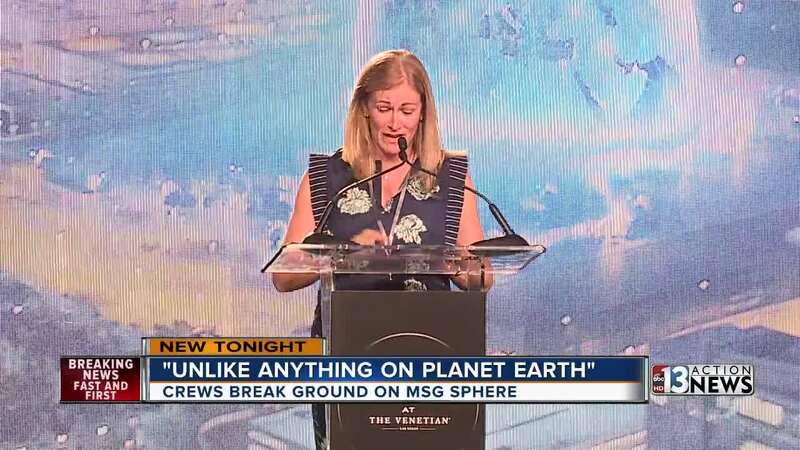 Scheduled to open sometime in fiscal 2021, the MSG Sphere at The Venetian is being touted as an otherworldly structure right here in the Entertainment Capital of the World. "It is unlike anything on planet earth. This will be the first of its kind right here in Las Vegas, Nevada," said Nevada Governor Brian Sandoval. Governor Sandoval joined executives from the Madison Square Garden Company and Las Vegas Sands in a ceremonial groundbreaking at the site on Sands Avenue between Manhattan Street and Koval Lane. The renderings of what MSG Sphere will look like when it's finished underscore the impact it will have on the local economy. It will create an estimated 3,500 jobs each year of construction; 4,400 jobs yearly once it is open and create $48 million in tax revenue. That includes $7.2 million earmarked for the Clark County School District. With state of the art features, it will have more than 18,000 seats standing 360 feet tall and more than 500 feet wide. "It is going to dominate the skyline and be just something that people travel all over the world to see and experience, " said Sandoval. A pedestrian bridge will connect the MSG Sphere to the Venetian and Palazzo.